Dark Red with a White Line Back and White Spotted Underneath. 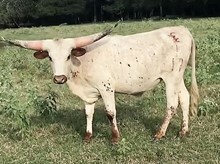 Beautiful young cow with a great disposition. This is a nice 4 year old cow out of LAR Smokin (full brother to CV Casanova). 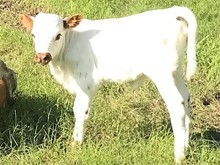 She had a Starfleet Commander heifer calf on 4/16/19. This is a very nice pair. Tip to Tip 41.8770 03/18/2016 Tracking to 77"